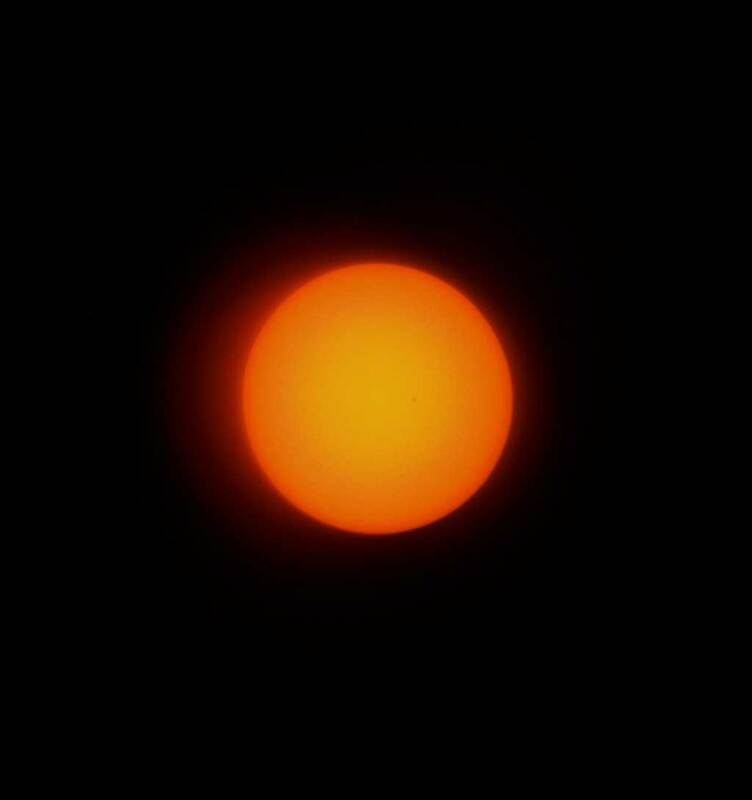 When we took a picture of the sun today, about 15 days to the hour ahead of the first total solar eclipse to touch the continental US in 38 years, we think we saw a sunspot or two. Look near the center of the sun’s disk at about 3:00. The photo on this page has been reduced in quality in order to accommodate loading on a webpage and to reduce the number of bytes needed for mobile readers. If you would like to see a full-resolution image, as our camera shot it, click on the link, wait a few seconds (the image is over 2 MB in size), and look closely. Sunspots are variable, with some lasting only a few hours while others persist for many months. The average temperature in the middle of a sunspot is 6,300°F, while the edges of the dark area reach 10,000°F. That’s a couple thousand degrees cooler than the average temperature on the surface of the sun. NASA says these regions are the size of Earth or larger. They are strongly linked with the sun’s magnetic field, some 2,500 times stronger than Earth’s. They occur in an 11-year cycle as the sun’s magnetic field shifts. Solar flares, or coronal mass ejections, which influence the appearance of the Aurora borealis on Earth, are also tied to the sun’s magnetic field. Sunspots themselves, however, have very little effect for us here on Earth.